Q. I would love your perspective on a question related to living tiny: I live in a small house, and the hardest part of reducing clutter for us is saying no to incoming clutter. Do you have a system to stop you or your family from bringing home unnecessary items/purchases, or to head off well-meaning but unneeded gifts from others? Thanks! A. Oh MAN. This one is so tough. Recently, we made the move from Austin, Texas, to Phoenix, Arizona for our next renovation project. 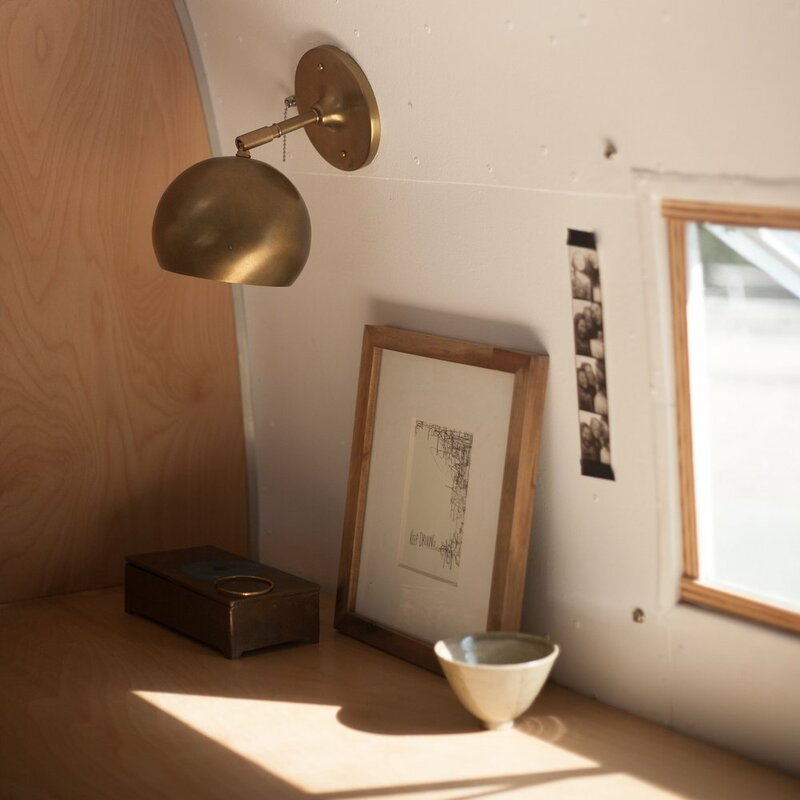 We’re currently living in a partially-renovated Airstream, but when we moved the Airstream here, it was even less finished. We literally had to move, as in, pack all our stuff in boxes and wrap it tightly so nothing would break. The inside of our Airstream looked like a moving van that we also climbed into and slept in at night. We’ve been here for a few weeks now, and already I’ve filled the backseat of our truck with three loads of stuff to donate, and have started another donation pile. We’ve got a lot of baskets and bins that are keeping me sane right now until we have cabinets to tuck things into, but a lot of them will need to go once we finish up building and have drawers and cabinets again. I realized recently that we tend to buy things for the interim to make ourselves comfortable - for example, we bought an electric blanket when it was icing in Texas, a ceramic water jug with a spout and stand to act as a faucet when we didn’t have running water...this is where we have room to grow in our minimalism. We end up donating these things once they’ve served a short purpose, and it’s frustrating to see that we’ve wasted money and resources on these items just to be a tad more comfortable in the short term (although, confession: the electric blanket is still in use and I love that thing...it’s sticking around). Overall, we live with very little compared to the average American household. We could fit all three of our wardrobes into one average sized dresser - shoes, coats, and accessories included, and still have room to spare. Minimalism is a continuous journey, and one we’re always on. It looks different for everyone, and whereas we might have more vintage kitchen items than someone else might, those bring me crazy joy to see and use! However, we are learning and continuing the process of editing according to how we live. In terms of well-meant gifts, this is where we run into issues. While we have only one daughter, she has multiple sets of grandparents and great-grandparents, aunts, uncles, great-aunts, and great-uncles. It can be really difficult for someone to understand that even though they may only be buying her one thing, she’s getting one thing (or multiple things) from everyone in her life, which adds up quickly...and they’re all coming into 200 square feet that is shared with two other human beings, two dogs, a cat, and a business. We’ve asked that in lieu of toys, people donate to our daughter’s college fund, but so far, only one person has, or that they buy her books for her Kindle. So far, no one has. We’ve not cracked the code on this one, and I wish we could say differently. If someone insists on giving us (Ellen and myself) gifts, we ask for Lowe’s gift cards, gas cards, or for something we need. We needed new linen sheets this year, and we asked for those for Christmas. People love giving gifts, especially grandparents and parents, and we don’t want to take that away just because we live small. However, the fact remains - we DO live small. We can’t keep everything that is gifted. The reality is that most of what we are given is donated right away, and we hate that our family members, or daughter’s family members on her dad’s side, are wasting their money, but ultimately, we can’t control what others do. We’ve made it clear we live small, and where their money could go, but it’s their choice. We, however, cannot live in a space packed to the brim with stuff, so out it goes. We are learning that communicating about the parameters by which we must live on a regular basis as key, and accepting gifts when given, with a smile and a thank you, is the best thing we can do. We cannot stop someone's gift from coming into our space, but we can control what we do after the thank you card has been written - we choose, daily, to live with less and to donate to those in need what we do not need.